Welcome to the 38 Challenge - our free and fun times tables practice activity. We wanted to show how effective a little extra times tables practice at home can be. And, to help parents support maths learning, as we know what a difference this support can make to learning outcomes. The 38 Challenge is a 3 step activity that will help children towards achieving instant recall of times tables - and truly mastering this important foundational maths skill. It&apos;s designed for children who have already started to learn times tables and there&apos;s a certificate for each child who completes the challenge. So you can see there are only 38 times tables to learn, and you will soon know them all! The practice grid will help you get ready for the 38 Challenge. Use it as many times as you like, until you can complete each one correctly and quickly! And if you need a little extra help, the times tables grid has all the answers so print it out and refer to it for the first few goes, but gradually move away from it. Why is speed important? When you&apos;ve really mastered your tables you&apos;ll be able to answer very quickly getting them right all the time. Once you&apos;ve done this you&apos;ll know them for the rest of your life! 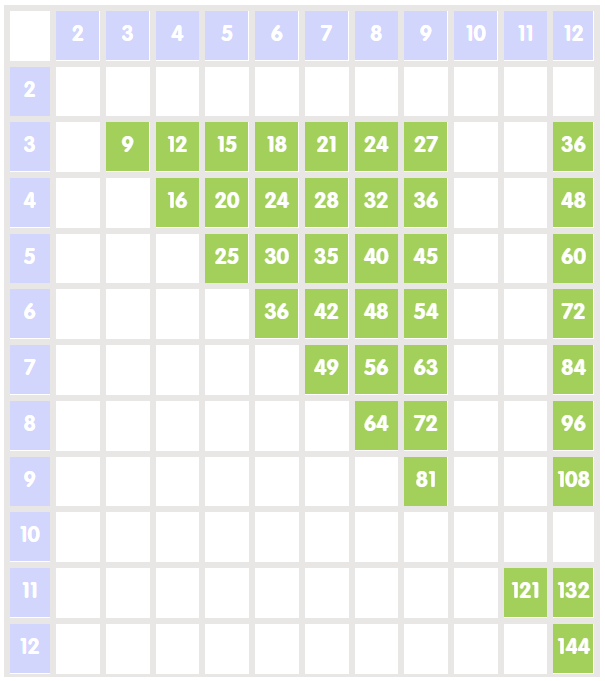 Click on the 38 Orange Squares and answer the question. If you can complete in under 5 minutes, you&apos;re ready for the 38 Challenge Quiz! STEP 3 - take the 38 Challenge Quiz and get your Certificate! Great! You&apos;re now ready to take the 38 Challenge Quiz! To begin the quiz you&apos;ll need your parent to register - this is because we email your certificate to them and let them know how well you have done. Well done for taking the 38 Challenge! If you didn&apos;t do as well as you&apos;d like, don&apos;t worry. Just come back, use the practice grid and take the quiz again. As a maths teacher, I can&apos;t stress enough how important it is for children to master their tables. When learners are able to fluently recall their tables it frees up working memory for applying maths to solve problems.